Your Marketo integration with InEvent can include created lists, associated emails, given names or attached tags. This synchronization makes it easy to import and export data between InEvent and Marketo, boosting your event management software to a new level. 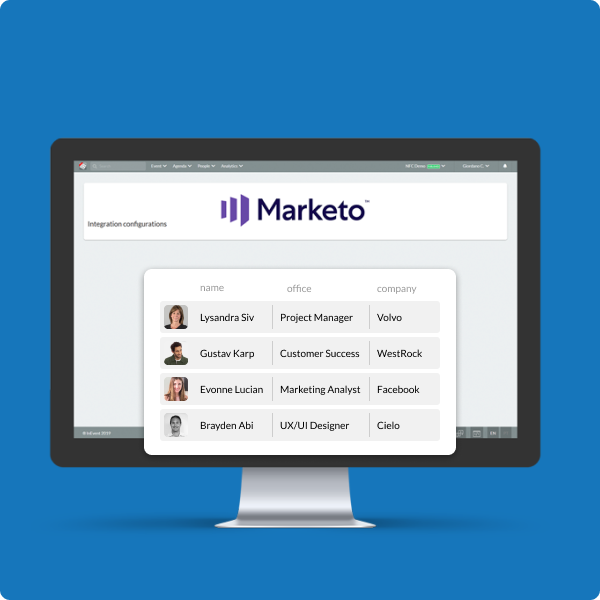 You will be able to automatically import all data captured on Marketo's landing pages to the InEvent platform, and also export your data from InEvent event platform to Marketo. Synchronization occurs automatically and even allows custom fields to be used! InEvent and Marketo partnership has been the core integration for innovative customers scaling their lead and relationship programs with attendees. Marketing and event teams are able to work together and deliver powerful results with InEvent globally awarded event platform. The first step you need is to aggregate your Calendar on both platforms. This is simple, with a pair of credentials from Marketo to the InEvent platform. You can also create a base program that will be cloned everytime a new event is created at InEvent event management software. This allows you to have more flexible Marketo Programs by having Smart Campaigns on your base program to be passed along to your new programs. All aspects of your base program are used when our integration runs. Using your smart lists on InEvent is also very easy, just select one of your smart or static lists available on your Marketo account to import your leads to your attendee management software powered by InEvent. You can to invite and RSVP on your event using InEvent event platform. All basic information of your lead is pulled and their membership status on your Marketo Program is updated automatically with your event management software. Great! Now your leads will start filling in their registration forms. By doing it, it will change their status to Attendeed on both platforms, so you can keep track of everything happening at InEvent event platform and Marketo marketing platform. Same for leads that rejected the invitation, they'll be removed from the member list. In case one of your leads unsubscribes from your marketing communication, our systems will automatically update their Unsubscribed status on Marketo and fill a reason on their Unsubscribed Reason field. Now, we're on the digital age, so your guests expect to have an automated check-in system with a QR Code Badge Printing solution. By scanning their QR Codes on your self-service kiosk, they'll receive a badge and their membership status will be updated to Attended on both platforms. Your reports can also be accessed live with InEvent event platform or with Marketo reporting systems, allowing complex segmentation filters to manage the individual relationship developed with each of your attendees.